My brief WNYC comments and related CultureGrrl post on the Museum of Modern Art’s just opened exhibition, Frank Lloyd Wright and the City: Density vs.Dispersal (to June 1), didn’t adequately explain what this show is about. Who better to do that job than the show’s co-organizer, Barry Bergdoll, MoMA’s acting chief curator for architecture and design? He nominally left his chief curatorship last summer to return full time to his art-history professorship at Columbia University. But he’s still acting in the chief curator’s role until MoMA chooses a permanent replacement, and he plans to continue curating exhibitions there, even after someone is named. For the debut exhibition at MoMA of drawings and models from the Frank Lloyd Wright Foundation’s archives (jointly acquired more than a year ago by MoMA and Columbia University), Bergdoll pointedly resisted the temptation to do a crowd-pleasing “masterpieces” show. 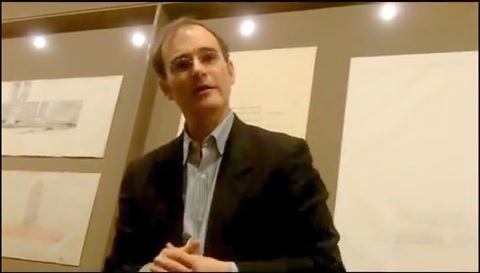 Instead, he and co-curator Carole Ann Fabian, director of Columbia’s Avery Architectural and Fine Arts Library, chose to explore an intriguing, sometimes perplexing subset of Wright’s work—his eccentric notions of urban (or non-urban) planning, which never gained much traction, but which, for better or worse, have new relevance today.